Last week GIS/Forest Management Technology instructor Blair Bishop and GIS certifcate student Eric Goltry attended the 29th annual Geospatial Information Technology Associations meeting in Tampa, Florida. 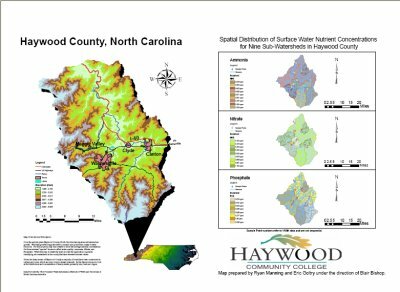 During the conference Eric presented a poster entitled "The Spatial Distribution of Surface Water Nutrient Concentrations for Nine Sub-Watersheds in Haywood County, North Carolina". Eric is the first HCC GIS certificate student to present at a large annual international conference; way to go Eric!!! Also during this trip Blair got to meet with a few D.O.L.E.T.A folks to say thank you and join a panel discussion on identifying skill sets and competencies for the 21st Century Geospatial Workforce. Thanks HCC-Foundation for our MINI-GRANT!!!! !